ANIMALS that use visual signals usually communicate during the day and rely upon the light from the sun to illuminate their displays, but fireflies are among the species that can communicate by night because they emit their own light. They are remarkably efficient at emitting light, unlike most natural and man-made light sources, which also generate heat. The males fly around, producing a pattern of light flashes which are characteristic of the species to which they belong. The females have a different flash pattern with which they reply and this enables the males to home in on them in the dark to mate. A North American black firefly male, for example, will flash every 5.7 seconds while he is airborne, seeking a mate. Then, when he is 10-14 feet from a female on the ground, she flashes back exactly 2.1 seconds after him. Some male fireflies can even flash different colours  they produce orange flashes in flight and green ones when they are on the ground. In one species, photinus macdermotti, the male makes two flashes about two seconds apart and, if the female detects them, she replies with a single flash about one second later. The female replies only if the males signal is absolutely right. So, in a locality where there are many species, these simple code-like signals can enable individuals to ensure that they obtain mates belonging to the same species as themselves. There are, however, some fascinating complexities in the situation. The females of the predatory fireflies called photuris versicolon, sit in wait until they detect the flashes of the male of another species and then mimic the flash pattern of the appropriate female: For example, they give a single flash corresponding to the photinus males signal described above. The unfortunate male flies in to mate and ends up being eaten. Not surprisingly, the males of the several different species that photuris females can imitate have become rather wary in their approach to prospective mates! What of the photuris male? He too can imitate the flashes of other species, but seems not to use this ability to find prey. Instead he waits for the answering female, flies in close to her and then switches to the pattern of his own species. In this way he discovers a female with whom he can mate and avoids the unpleasant end that she reserves for the males of other species. Various species of fireflies occur in India, Southeast Asia, South America and the warmer parts of Europe and the USA, where they are sometimes known as lightning bugs. They are actually beetles that flash light from their abdominal organs. Displays vary from isolated sparkles to the breathtaking orchestrations of large groups that are a feature of moonless nights in many countries. In one South American species, the female on her own displays 11 pairs of green lights and a ruby-red glow at her head. In all species, the light is produced by a chemical known as luciferin, stored behind areas of transparent cuticle backed by dense tissue that probably acts as a reflector. The fire of the fireflies is a misnomer, for the light they produce is cold and, in of energy, terms, remarkably efficient. 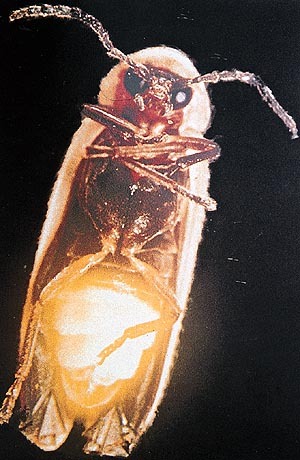 Whereas most electric bulbs waste 97 per cent of their energy in heat, a firefly concentrates 90 per cent of its effort in light. The glow emerging from so tiny an animal, though scarcely dazzling, is sufficient to read a printed page. Poor Japanese students, it is said, used fireflies to illuminate their nocturnal studies. In parts of South America, the flies were enclosed in perforated gourds for domestic lighting, and girls use them as hair ornaments during village festivals. As far as the insects are concerned, their main reason for glowing in the dark is to advertise their readiness to mate. The males perform aerobatics, making light patterns that are answered by the females, each species producing its own characteristic recognition signals. Like naval night signals, these are remarkably precise. A male emits pulses of light that, after an exact interval, are answered by a female of the same species. Only if the timing and response are correct, will a male fly over to visit a female. Most glow-worms, which are also beetles like their relatives fireflies, are in fact the wingless females or larvae of certain species of firefly. The common European glow-worm of damp hedgerows and meadows is most active in June and July. The wingless females climb tall grass stems and hang head down, twisting their bodies to expose the greenish lantern under their rear ends. The winged males can home-in on this tiny signal from at least hundred yards away, though it seems that, if alarmed, the female can douse the light at will. Glow-worms, by contrast, emit an intense green light if they are disturbed, suggesting that their glow is intended to frighten off predators. If so, it is not always successful  it is not unusual to see frogs lit from within by a meal of glow-worms.